Saudi-led coalition aggression warplanes on Thursday stepped up their air strikes on Saada province, in conjunction with artillery and rocketry bombing on villages and civil facilities in the province. 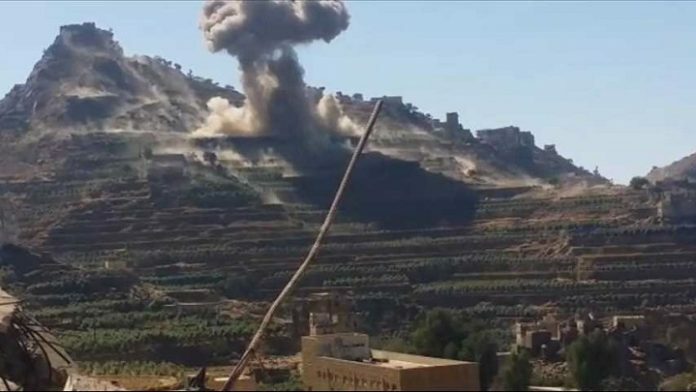 The coalition aircrafts carried out two airstrikes on villages and farms of Akwan area in al-Safra’a district, which caused large damage to property, according to a security source. Another airstrike hit al-Mahather area of Sahar district, while the warplanes continued to fly in the sky of the district and carried out an airstrike on the outskirts of Saada city. Meanwhile, the Saudi-led aggression launched artillery and rocketry bombardment on villages of Kutaf and al-Dhaher district, the source added.